Call with your Garden Shop Needs in Winston Salem, NC! Our quality and selection of perennials with prices you can’t beat will keep you coming back to our Winston Salem, NC garden shop year after year. Frank’s Perennial Border is a plant nursery and garden shop uniquely focused on perennials. It is located at 1744 W. Clemmonsville Rd, Winston Salem, NC – just 1 mile from Lowes (Stafford Village Blvd.) off of Peters Creek Parkway. Our plant nursery has a variety of plants that you will surely love to add to your home garden! At Frank’s, we specialize in growing hundreds of varieties of perennial plants, NC native plants, ground covers, hardy ferns, hosta, ornamental grass, flowering plants and flowering vines. Local greenhouse offers a relaxing shopping environment for native plants. Frank’s Perennial Border is one of the most trusted and experienced landscape nurseries in the Triad. This is why most local landscapers and retailers choose our local greenhouse when looking for the highest quality perennials, native plants and shrubs for their clients, and yes we are open to the public. 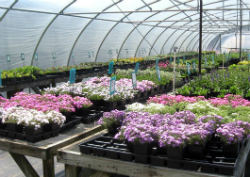 We have been in business for more than 25 years, and with our constant efforts, we produce both new and hard-to find perennial plants that perform well in this region. We are Winston Salem, NC's source of native plants. Our local greenhouse and garden shop is the best in Winston Salem, NC! Frank’s Perennial Border is not a typical garden shop. All of the plants are produced on our private 14 acre farm, in over 50,000 sq ft of greenhouse space. This means our plants are conditioned for local soil and climate. Our garden shop offers a relaxed environment in which our patrons can browse, ask questions, and enjoy just being outdoors. Stop by and see what you can find at our garden shop! Make your selections while crops are bountiful! Frank’s is open year round, but most of our crop is produced for the spring season. When a variety is sold out – that’s it. We are always planning for the next crop and every season brings fresh, new ideas to our nursery. Our local greenhouse has the flowering plants you want in Winston Salem, NC. While being a private plant nursery in a residential area allows us to ensure that our plants grow heartily in the area, we are not zoned for certain types of retail such as mulch, soil, fertilizer, etc. Be assured, if we sell it, it was grown by us. Our local greenhouse does have great resources that we will recommend to compliment your selections. We are certain you will love our variety of flowering plants and native plants. Stop by today and see our selection of flowering plants. Be unique and stay out of the big box. Horticulture and gardening have been a part of our lives for as long as we can remember. The primary goal of Frank’s Perennial Border is to offer distinctive perennials that are not typically found in garden centers and big box retailers. Our hands-on knowledge of these plants allows us to assist clients in choosing the “right plant for the right place”. We personally cultivate and care for the perennials and we are happy to share our experience. Frank’s Perennial Border is a plant nursery uniquely focused on perennials. It is located at 1744 W. Clemmonsville Rd, Winston-Salem, NC – just 1 mile from Lowes (Stafford Village Blvd) off of Peters Creek Parkway. At Frank’s, we specialize in growing over 400 varieties of perennials, ground covers, hardy ferns, hosta, ornamental grass, and flowering vines. Frank’s Perennial Border is not a typical garden shop. 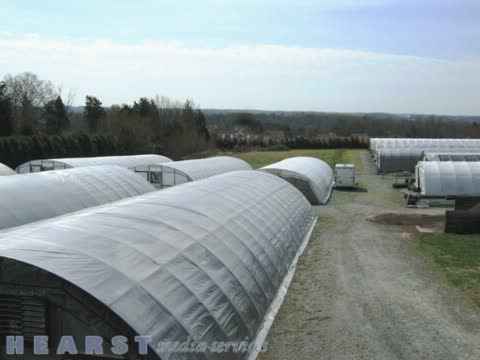 All of our plants are produced on our private 14 acre farm, in over 50,000 sq ft of greenhouse space.